A bit early for Robert Johnson, as two early Great War forces clash. 1914 French and Germans close upon the ruins of a small hamlet based at the crossroads. The Germans set up their heavy Machine Gun in a nice position to dominate and secure their left flank, plus be in a position to fire into the hamlet. Fire from this almost instantly destroyed a French squad and forced the rest of the opposing forces on that flank into cover. 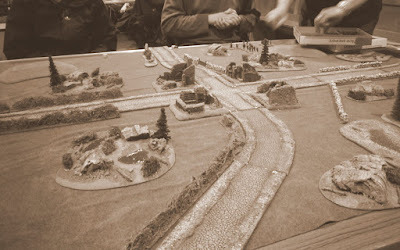 The French instead concentrated in pushing up the road to the hamlet and then setting their MGs up in the ruins. The French took advantage of an house rule where an MG can be re-crewed once loses were taken, by lining up a section of infantry behind them in cover. The guns became virtually indestructible. At least the house rule where HMG's can be moved after deployment didn't seem to be in use. The German right flank got pinned down and gradually eroded. The left pushed into half of the town, but any attempt to knock out the super MGs failed. I don't like the constant mod-ing of the MG rules as I feel the original rules cover their operations perfectly well. They are advanced bits of equipment not for lugging around 'Arnie style' and although might continue working for a short while in unskilled hands will soon fail.